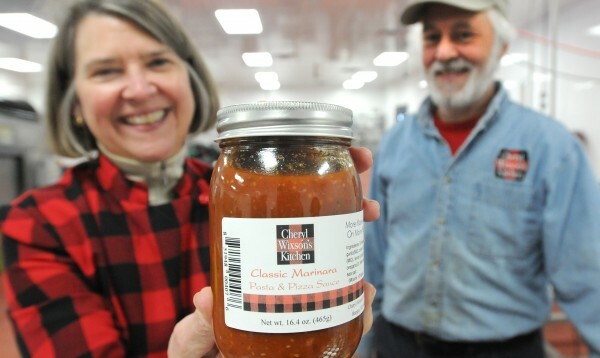 Cheryl Wixson (left) and her husband, Phillip McFarland, show off marinara sauce marketed under the name of Cheryl Wixson Kitchen at the Coastal Farms and Foods facility in Belfast in Jan. 2013. BELFAST, Maine — Less than two years after a food processing facility started operations in a former manufacturing warehouse off U.S. Route 1, company officials said it soon will go dark, and that its tenants must find a new home. She said that her creditor will take possession of the facility shortly, and that as of this week, the electricity will be disconnected on April 22. The problem, Anderson said, is that for two years in a row, the blueberry freezing portion of the business — a major part of the new operation’s business plan — failed. The 50,000-square-foot business, located in the former Moss Inc. manufacturing facility, was incorporated in 2011, and had raised $2 million in private investment and financing by the following year. Company officials told the Bangor Daily News in 2013 that the space could easily fit 100 producers. Anderson said Friday it currently is home to 15 food processors, including makers of ice cream, soda, dilly beans and blueberry vinaigrette. Additionally, nearly 50 farmers use its cooler storage, she said. But Cheryl Wixson of Cheryl Wixson’s Kitchen said that the only primary recent tenants have been her prepared food business and Jeff Wolovitz of Heiwa Tofu. She said Friday morning that she’d been notified just 15 minutes earlier that she would have to move all her products and equipment out of the space by April 21. Wixson said that, fortunately, her company’s schedule of taking the summer harvest and using it over the winter months to make products including fruit ketchups, marinara sauce and much more means that this was the last production week of the year. Wixson said that in contrast to Coastal Farms and Foods Inc., her company had the opportunity to make its early mistakes on a small scale. Thomas Kittredge, the Belfast economic development director, said that the city is hoping to help the food processing tenants find a home in Belfast, if they want to stay here. Anderson is still hoping for a last-minute food processing miracle.